He was born in 347 of famous, rich and pious inhabitants of Antioch, Secundus and Anthusa. Having lost his father early, he grew up under the direction of his pious mother, known for her high intellectual and moral qualities and who has devoted, despite her youth, herself exclusively to his education. The pious and chaste widow by her humble affection instilled in her son a loving heart, natural to him, and by her example of a truly Christian life taught him in accordance with the will of God self-denial for the sake of the highest moral purposes and unshakable firmness in pursuing these goals, and in the struggle with the trials and tribulations of life. In all of his early childhood John was occupied with the Holy Scriptures, studying it under the direction of his mother. The early acquaintance with the Bible and the beneficent influence on the heart of John by his virtuous mother instilled in him an ardent aspiration to virtue and the sacred life, and revulsion to the splendor prevailing everywhere in his time, and to all the generation of the prophets. In his youth John studied under the famous orator Libanius. Upon completing his education, Saint John became a lawyer and soon achieved fame for his eloquence. The moral feeling, fostered by his Christian education, restrained John from enthusiasm for worldly vanity, and he soon left the secular life and civil service and, living in the world, began to follow strictly a selfless life. St. Meletius, bishop of Antioch, having noticed the great talents of John and his openly Christian attitude, approached him to complete his instruction in the Christian faith and baptized him (in the 25th year of his life), and during the year (370) tonsured him as reader of the Antiochian church. John, not looking at his illustrious birth, his great talent and his already acquired fame as an eloquent orator, humbly accepted the humble rank of reader, witnessed to by his deep devotion to the Church. Fulfilling the duties of the reader, he at this time continued seriously to study the Holy Scriptures. Following his love for monasticism, John was ready to withdraw to the solitary life, but as an obedient and loving son, at the request of his mother, continued to live in her house. After the death of his mother, St. John gave his estate to the poor, freed his slaves, left for the desert and lived four years in ascetic labors of communal monasticism, and then, wishing to enter the ascetic life of a full hermit, he entered one cave, where he lived for two years (379-380) in unreasonably strict and severe ascetic labors. The ascetic labors enriched his experiences of spiritual life, his knowledge of the human heart and strengthened in him a high ideal of moral perfection. After the impairment of his health, and his need to return to Antioch, St. John was ordained to the rank of deacon by St. Meletius in 381. This decision to entirely devote his life to sacred service for St. John was submission to the will of the bishop and the expression of maturity in the ascetic deeds of monasticism. Besides serving the divine services and the supervision of the deanery in church assemblies, St. John as a deacon conducted works of ecclesiastical charity and executed various assignments of the bishop. It prepared him for an effective life. The visitation to the rich to ask them alms for the poor and to the poor to help them, gave St. John an all around knowledge of life and people and even more inflamed in him a love for the people and compassion for those living in misery and the needy. 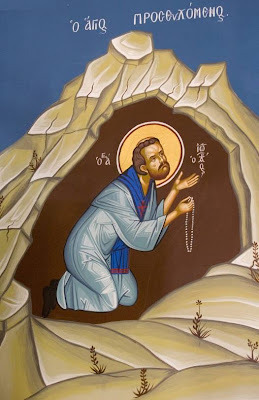 The first money, which St. John gave back to the poor, was his own, and from that day up to his very death he had nothing, and it may be said that he was the first poor man in the Antiochian church. Ordained (in 386) to the rank of priest in Antioch, Saint John tirelessly preached the word of God. He preached sermons at least once a week, for the most part twice, and quite often each day. In his sermons Saint John explained Holy Scripture, rose up against false teachers, praised the ascetic exploits of the saints, censured unrighteousness and especially cruelty to the poor. The inhabitants of Antioch, drawn by his eloquence, not only the Orthodox, but also the heretics and even those of Judea and the pagans, crowded about to hear him, interrupted his sermon by loud applause, and sometimes, touched to the depth of their souls, began to cry and to sob. Especially was Saint John blessed with the gifts of smooth speech that he had become famous during a time of national rebellion arising in 387 by the imposition by the Antiochians of new taxes and the destruction of the imperial statues. Then the holy preacher was shown to be a true father – a comforter, a spiritual leader to his disciples, each day soothing their complaints and their cries by conversations (On the Statues, 21) in the market place and in the temple. The sermon of Saint John thundered without tiring from the church cathedra and the fame of his eloquence was propagated to all corners of the empire. During one sermon, he received from one woman the name of Chrysostom (Golden-Mouthed). In 397 Saint John was consecrated the archbishop of Constantinople. Pouring out "with a mouth of golden radiance" "the rivers of sweet teachings", he fervently made an effort to maintain his congregation "in holiness and truth". As "an earthly angel and celestial man", Saint John, being an example of virtue, also taught others the holy life. He cared much for the improvement of the Constantinople clergy; was the trustee and advocate of the widows, the orphans and the poor; and built hospitals and hospices. The activity of the caring bishop was not limited to only the Constantinople diocese, but reached even to the others, even to remote countries: he sent missionaries to Thrace, Arabia, Persia, and God blessed his apostolic work: the wild barbarians left their worship of idols, and converted to the religion of peace and love. The flaming zeal for Orthodoxy, the unshakable steadfastness in faith, the fervent love for his neighbors, the spirit of meekness, the wise moderation and condescension for the fallen, the spirit of a living faith and the rare pastoral persistence demanding of all the true life of a Christian, - absorbed the entire life and activity of the great hierarch. Full of love and with strict words he boldly railed against the prevailing vices of his congregation, especially the passion for theatrical shows, the love of money and the cruelty of the rich, the women’s passion for the latest fashion and dress, and the various superstitions of the simple people. The impartial sermon of Saint John, his strict accusation of the vices which he railed against, without any concessions to rank or position, soon rallied the wealthy, the elite and many others against him, and upon him came the denunciation of the Empress Eudoxia. The obvious slander, the spiteful misinterpretation of his words and his acts laid guilt on him, and the great teacher of the Church in the sixth year of his episcopal service was condemned to exile. Because of the occurrence of an earthquake after his departure and the concern of the people, he returned from exile back to Constantinople, and continued as before to thunder against the vices of society and within six months was again sent into exile to the city of Cucusus (in Armenia), and then within two years still further to Abassia (see the New Athonite Monastery in the Georgian exarchate). But on the way to Abassia Saint John died in the city of Comana (407). 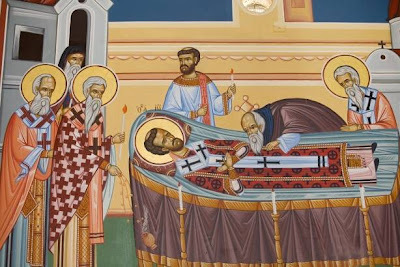 The last words of Saint John – this great ecumenical teacher, the smooth speaking preacher, the strict charitable and loving pastor, were: "Glory to God for all things!" In the church chants Saint John is praised, as "pillar of the church", "treasury of good deeds", "the wisdom of the depths", "great bishop", shining "into all the world, more than the rays of the sun with good deeds and pearly words, more wise than the wisest, and the greatest rhetor, defender of true doctrine, revealer of lies, teacher of repentance", “father of orphans, speedy help to the injured, alms to the poor and drink to the thirsty". There is the existence of his Order of the Divine Liturgy known under the name of Chrysostom. 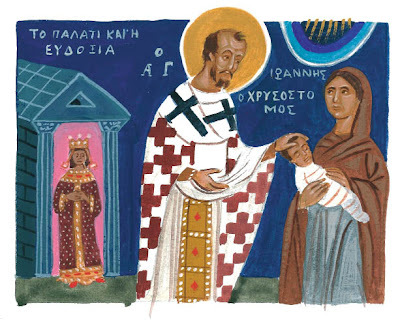 Besides this, the Church has received from Saint John Chrysostom the teaching Concerning the Priesthood (representing an ideal Christian shepherd, his cycle of duties and the quality of service required of him), the numerous Scripture commentaries, contained in his works (about 800), the sacred hymns, the commentary on the word of God in letters to various persons, and his other compositions. In his works he is of incomparable wit and the greatest in oratory. No one possessed such a plenitude of speech, in which he was so rich. The most abstract subjects of faith in his descriptions are clear for everyone, because he explains them by comparisons, by pictures. Under his well-delivered speeches one always hears the presence of poetical feeling, generated by a lot of captivating pictures and images. By his own words he with inimitable artistic touches, rejoices, excites the emotions of the soul and convinces. As in the basis of all of his acts lay the love, that love which penetrated even to his every word. Saint John was preeminently a preacher of love in his sermons and breathes authority and perseverance, an unusual sensitivity and sincerity. 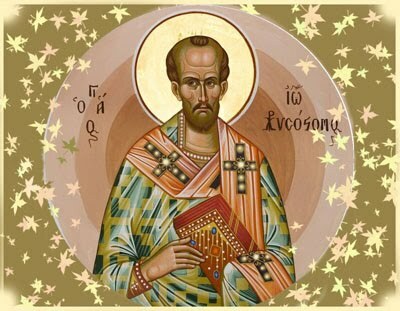 It is impossible to present all the power and interest of the conversations of Saint Chrysostom, in which one may find the connection to all that is the highest in oratory and most convincing in the hidden conduct of conscience and hearts. These talks represent by themselves the best examples for imitation of preachers in all centuries and peoples. Our ancestors drew up a lot of “book sweetness” from the works of Saint Chrysostom and for them these works were the most favored reading. And at the present time everyone looking for spiritual truth and deep edification will find for himself a fuller satisfaction in the eternal works of Saint John Chrysostom. They always were new and will ever stay new. About the divine Chrysostom, Saint Demetrius of Rostov says: “It is right to say, he surpassed the reason of all the Hellenic wise men, by word and delightful speech the divine Scripture is beautifully explained and commented on”. Grace shining forth from your lips like a beacon has enlightened the universe. It has shown to the world the riches of poverty, and revealed to us the heights of humility. Teaching us by your words, Father John Chrysostom, intercede before the Word, Christ our God, to save our souls. Having received divine grace from heaven, you teach all men to worship the one God in Trinity. All-blessed John Chrysostom, we rightly praise you, for you are our teacher, revealing things divine.